PYONGYANG - Until a decade ago or so, Japanese was one of the most popular languages studied by elite students in North Korea, even though the two countries have never had good relations, diplomatic or otherwise. But today the situation is very different. 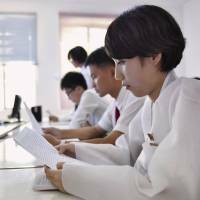 At the only North Korean university where students can major in Japanese, classes of the language are sparsely attended, while mastering English or Chinese is increasingly viewed as the surest way to get a good job. When Kyodo News was granted rare access to Pyongyang University of Foreign Studies in September, officials disclosed that only about 40 students are currently specializing in Japanese at the institution. The university, founded in 1949, has some 1,800 students and teaches 23 different languages, according to Hong Gyong Sop, vice head of the institution. Of those students, Hong said more than 800 major in English, with Chinese the next most popular language, followed by Russian. He said Japanese no longer existed as an independent faculty at the university. He said Japanese was absorbed into the faculty of ethnic languages in 2007 due to a steady fall in the number of students. Many graduates of the university work at North Korea’s Foreign Ministry, media and other organizations that have connections with the outside world. The officials and students cited the Japanese government’s hard stance on North Korea as the major cause of the decrease. In the 1990s and early 2000s, nearly 200 students were attending the Japanese faculty at any given time, according to Kim. It was the time of the last Japanese boom, he recalled, and coincided with a 1990 joint declaration between North’s ruling Workers’ Party and Japan’s major parties calling for the creation of formal diplomatic ties. The signing of the document in Pyongyang raised young North Koreans’ expectations for more exchanges and jobs in Japan. But relations between the two countries did not turn out as well as expected. Instead quite the opposite happened. Almost no meaningful progress has been made in resolving outstanding issues and Tokyo-Pyongyang relations remain sour. For Japan, before normalizing diplomatic relations, the issue of highest priority is the past abductions of its nationals by Pyongyang’s agents. Japan is far from satisfied with North Korea’s handling of the issue, namely the lack of information given by Pyongyang to date on the whereabouts of those still missing since the 1970s and 1980s. Despite numerous ongoing political difficulties, 10 students in their fifth year of the Japanese course at the university were studying hard, and their language levels were very high. It was easy to see the students were fluent in Japanese and capable of reading difficult texts, while all instructions were given in Japanese by a North Korean teacher. Yet when asked why they decided to learn Japanese, one female student stood up and said resolutely, “As I had loved kanji characters from my childhood, I began the study. But I regret it now as the Japanese government continues with its hostile policy against our country. “I think everyone in this classroom feels the same,” she added.